We're back with a brief post covering the release of a new photo of Her Majesty the Queen with her three heirs, Prince Charles, Prince William, and the ever-adorable Prince George to mark a new set of stamps by the Royal Mail to mark Her Majesty's 90th birthday on Thursday. The foursome are impeccably matched in shades of blue for the image taken in the White Drawing Room at Buckingham Palace. Taken last June, the smiling tot is photographed perched on a stack of foam blocks to raise him to the correct height, so he can hold William's hand. London-based Ranald Mackechnie, a specialist portrait photographer, described how he came up with a plan to ensure the Prince's head appeared at roughly the same height as the adults, revealing he and his team spent two days setting up a test shoot with the blocks before the final shoot. 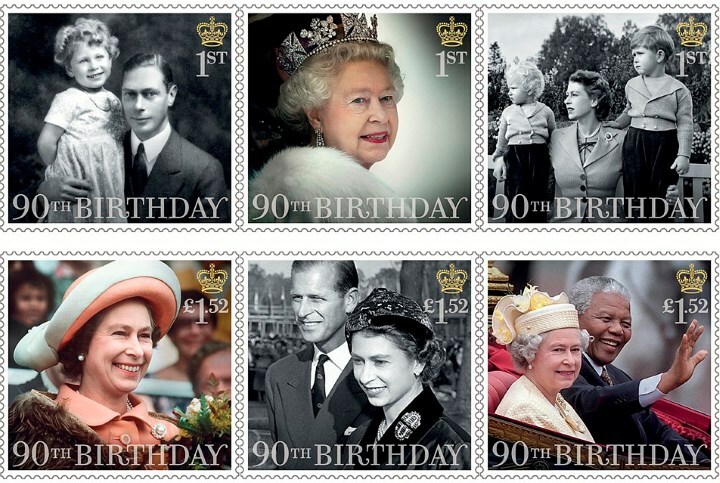 '"It's great just to be asked to photograph a stamp, never mind four generations of the Royal family. When I was asked about I was ecstatic but I had to keep schtum for 18 months," he said. "It was an amazingly relaxing and light-hearted sitting. They were comfortable with one another and behaved like any family with their conversation and jokes. It was much more relaxed than when I've tried to take pictures with my family. Indeed, it was milestone moment for Prince George, who turns three in July, posing for the first of many postage stamps he will feature in throughout his life. The commemorative first class stamps will be sold in sheets of four for £2.56 with a stamp featuring the Queen, Charles, William and George on each sheet. For example, if one wanted five Prince George stamps, they would have to purchase five full sheets. They are available to order on the Royal Mail website. 'If monarchy stands for anything, it is continuity and stability. And this superb image, captured in the White Drawing Room of Buckingham Palace by Royal Mail photographer Ranald Mackechnie a few months ago, reinforces that. Think of it this way. When Prince George is celebrating his own 90th birthday, it will be the year 2103. And the world will look back on this image of four monarchs stretching over two millennia, three centuries and 177 years, going all the way back to the birth of Princess Elizabeth of York in 1926. 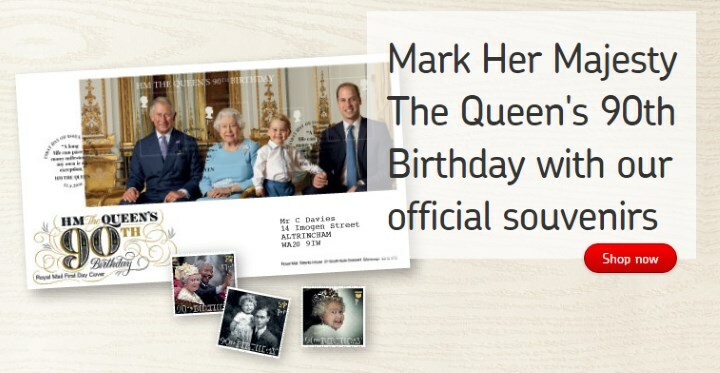 A further six stamps are also being released to mark the Queen's birthday; an excellent selection of photos were chosen to represent various stages of her life. They show the Queen: as a young Princess Elizabeth with her father, then the Duke of York in around 1930; attending the State Opening of Parliament in 2012; with Princess Anne and Prince Charles in 1952; visiting New Zealand in 1977; with the Duke of Edinburgh in 1957; and riding in an open top carriage with Nelson Mandela in 1996. The set of six is available for £6.48 on the Royal Mail website. The photo graces the covers of several newspapers today. 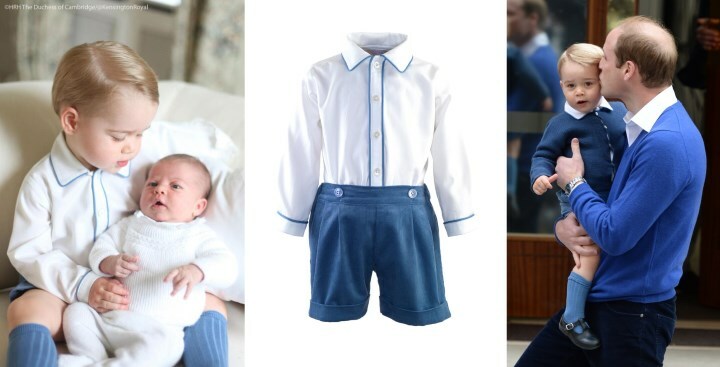 Of course, readers will recognise Prince George's Rachel Riley outfit - it is the same one he wore for Kate's photos of him and Charlotte taken at Anmer Hall around the same time as the photo for the stamp. George also wore the Cord Short and Shirt Set to meet his sister at St Mary's Hospital in May. The $159 set is described as: "A smart shirt and cord short set comprising a classic white shirt with blue piping detail with matching blue babycord turn-up shorts with an elasticated back waist, attached to the shirt with pearl effect buttons. Perfect for a special occasion. Pair with one of our baby boy Heritage cardigans." Once again, it was teamed with his Amaia Kids socks. We have one more update to share with you tonight. 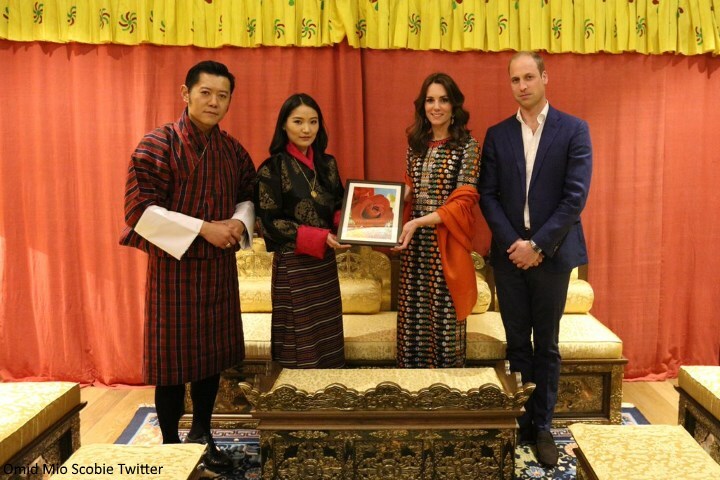 The Duke and Duchess of Cambridge enjoyed a private evening with the King and Queen of Bhutan. The couple were photographed leaving their hotel with Kate wearing the Tory Burch Floral Mesh Gown. Earlier today an image from the evening surfaced. 'It has now been revealed that during the audience in Thimphu, William and Kate showed their gratitude to the royals by giving the 25-year-old queen a framed picture of a rose. Minister for Asia, Hugo Swire said: "I am delighted that Their Royal Highnesses have been able to present this rose to the King and Queen of Bhutan as a symbolic gesture of the growing friendship between our two countries." Of course, we know Queen Jetsun gave Kate a lovely gold necklace during the evening which she wore the next morning at Paro Airport. Simply Bhutan shared more about the symbolism of the piece: "This is 1 of the 8 auspicious symbols in Buddhism and symbolises union of wisdom and great compassion." We expect we may very well see more photos released to mark the Queen's 90th over the next day or two - most notably a rumoured photo of HM with her great-grandchildren taken by Annie Leibovitz. Yay a new post!! I knew when I saw the picture of George I knew I saw his outfit before. I didn't realize that this pic was taken last June though. I wordered how much George has changed?? What is the next poll going to be on?? What a beautiful family picture! Happy 90th Birthday your Majesty! And many, many more! And as they say in Poland, Sto Lat! Absolutely! I was hoping for something like this. I wish the photo was one that wasn't taken almost a year ago! George looks so different from then! Since this was taken last year it is safe to assume the shoot at Windsor last month will hopefully reveal so more updates photos! Hopefully they are shared with the public! Mege Excellent post! Thanks a lot! 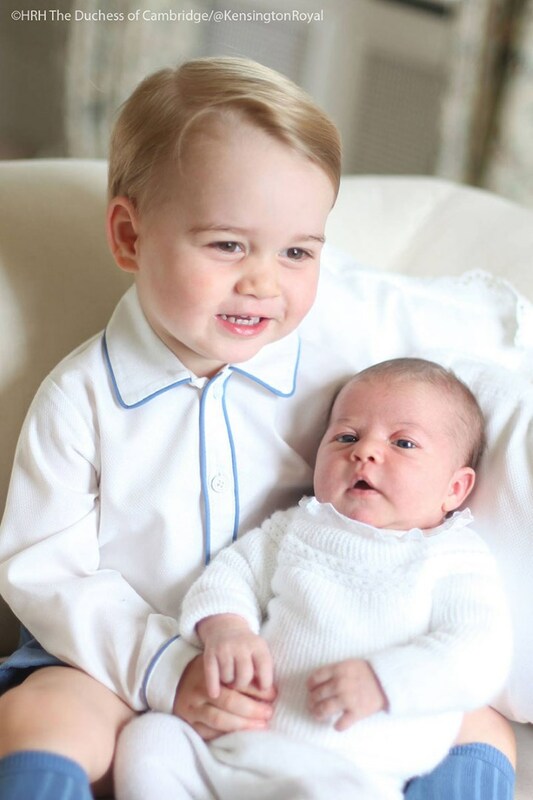 I have a feeling George has grown and changed a lot since this photo was taken last summer, and I hope we get to see some more in the days to come (including Charlotte). This is a beautiful picture and George looks like an even balance of William and Michael Middleton. Charlotte, as usual, your work and devotion to the blog are incredible and so enjoyable to read. I tend to go back multiple times to look at all the pictures! I have a question though, I REALLY want a sheet of the new stamps shown in this article, but I can't seem to buy them from the site that was linked on this post. Have you any idea how I could get a sheet? It would be just the perfect addition to my Royal Family collection of artifacts. Thanks so much. Thank you so much for your comment. Is the Royal Mail website working for you now? I understand they were experiencing issues last night. Dear Charlotte, I echo Sparky and The Professor's comments on how brilliant your blog and devotion to it truly are. The RM website link worked for me at the time of this post...and Rebecca, what a bon mot, I laughed out loud! I was wondering if anyone from the U.S. ordered the stamps. I tried to order today and it said it could not be processed. Thanks for any help you can give me. Charlotte, I have been reading your blog for years! Thank you so much for all the hard work you put in to everything! Excellent blog! Wow, yay!!! That is such an adorable photo. They all look wonderful. Now this is taking family portraits to a whole new level. This week is shaping up to be quite eventful. First I congratulate the photographer. I know how difficult portrait photography is, and this one is an achievement. They all look good and the composition is perfect. Prince George is a remarkedly present child. Going back to the beginning, even his christening photos exhibited an awareness of his surroundings. His engaging spirit just comes barreling across to the viewer. I look forward to new photos in the coming days that are more current. This one is sure a beauty. I agree Anon 03.20 and 14.59. Some people say he looks "sad" because he's not smiling all the time. But to me, you can just see the wheels turning in his head and he seem to be a really curious child from the little we can see! Are you a photographer? If so, I have a question - why weren't the foam blocks covered with something like a cloth, any guesses? They don't really fit in to this majestic setting. But, as you said, great composition! Overall great job, just think the uncovered "raw" blocks detract just a tad. Anon 17.15, the full-length shot is the equivalent of a "behind the scenes" photo. The shoot was for the stamps, which are head shots only; this is just a "how it was done" photo. I love it. I understand the actual stamp was only going to portray their heads and shoulders so it didn't matter that he was going to be standing on those blocks. The important thing was to have all four heads about the same level. Thanks Anon1810! Makes sense now. The photographer was there for hours. He had been given a template as to how the heads were to be on the stamps and he had computers set up looking at exactly how each photo was fitting the template. He took about 100 photos. (Photographer's comment) he has a website -excellent portrait photographer. Well worth a look. Just goggle his name and it comes up. At first glance, I thought the foam blocks were big books held together with the usual webbing band. They look a bit like volumes of statutes or statistical records, which is rather nice. "sizing up the Queen", lol, 14:59. That is so funny because that is what I thought the first time I saw the video of George's christening. Anonymous 20 April 2016 at 03:20, I so agree. That is one adorable little tot. He is the spitting image of his maternal grandfather! I agree bluhare. Michael surely has to get a kick out of that. Michael is always in the background, but his look-alike Royal grandson is not. What a lovely picture! And so historically meaningful too. I do think it's a mistake for Kate and William to dress George in the same clothes for multiple sets of pictures. 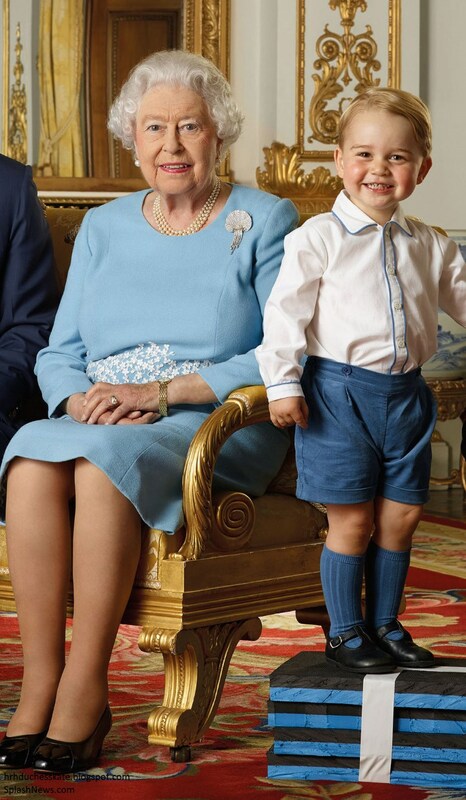 This outfit works great for this picture, and is fine for the others too, but as the Mail Online says, let's imagine it's George's 90th birthday and he is hopefully the King. Imagine looking at three historic pictures of him - one from when he went to meet his baby sister for the first time ever, one from the first pictures of him and his baby sister together, and one from a historic picture of him with the 3 previous monarchs. And then imagine all 3 of those pictures having him in the same clothes. It hurts the significance of those pictures in terms of them portraying individual, yet equally important events. This really isn't a big deal and I'm not trying to ruin anyone's enjoyment of these photos. I honestly just sometimes feel like while it is certainly important that George's clothes don't distract from the event, especially when he is so young, sometimes maybe the Cambridges are not fully considering the magnitude/value that these pictures will all have for a LONG time to come. But maybe I'm wrong about this. I'd love to know what others think. But again, I'm not trying to ruin anyone else's enjoyment of these pictures. Ultimately, they are all lovely, especially the one just released. Maggie, I think Julia brought up the same points about Kate's repeats. I agree. I love Kate dressing George in outfits like William (and Charles) wore. that Kate took at Amner Hall. George's outfit for this current photo for the commemorative stamp needed to be new and specific to this momentous occasion. The pictures you refer to were all taken within a month of each other, so I have no problem in them dressing him in the same clothes especially if they work with the colour required by the photographer. Kids at this age grow so quickly, that it is not necessary to have multilple special outfits. It is possible that the photos with Charlotte were meant to be family photos, not widely distributed. I think this may have been mentioned at the time. anyone possibly find to criticise about this beautiful photo?" I don't think it matters. He looks fine and obviously the photographer asked them to wear blue. I think it's a beautiful picture and I don't think there needs to be a "but" after that. I too feel that George's outfit has worn out its welcome. We just saw Kate in well over a dozen new outfits that probably will not be worn again, and here is George in a shop-worn old fashioned looking outfit, for a very important photograph. It looks like they unwilling to pay the money to put him in new more up to date children's clothes. Or maybe because he is growing so quickly they only have a couple of "best" outfits? Old fashioned maybe but obviously Catherine likes the outfits which echo William's own when he was young. Not sure how "shop-worn" fits in and I am sure spending money isn't a problem! ..."Charlotte pictures." Not stamp pictures. Barbara - I honestly like the old fashionedness of George's outfit for this picture since it's 4 (hopefully) monarchs, including the longest reigning ever, who is also his great-grandmother. I like the old-fashionedness of his outfits in most other instances of pictures/events, but its just a slight preference more than real criticism. Anon 16:53 - yes, sorry, heaven forbid someone try to initiate a friendly discussion about the best way to honor the future historical value of current pictures on a blog about royalty. But also, KP said the pictures with Charlotte were taken at Anmer, so unless they went from London to Anmer, took pictures at both on the same day, while keeping George in the clothes on the drive in between - which all seems highly unlikely - that is not how it happened. But yeah, like I said - this isn't really criticism, so much as an interesting discussion for me in terms of how historical these pictures will be one day. These photos were take last June, about the same time as the ones with Charlotte. Why does a happy picture have to be criticized? the shirt in the hospital photos. I didn't even realise it was the same outfit and I doubt anyone who doesn't read a Kate blog would know or care. 16:53 and Jean from Lanc, I share your disappointment. How nice if folks could put themselves in William and Kate's shoes ... you love your little one more than life itself, you dress him up for a very special and historical photograph, the child is beaming from ear to ear and everything points to him being a very happy and much loved little boy........if only you dressed him correctly. It seems that knocking photos of George and Charlotte is becoming a tradition. George is dressed in a traditional and appropriate outfit for a little boy his age. Perhaps some of the concern could be directed at the DM regulars who would have CPS knocking at their doors if not for their bank accounts. 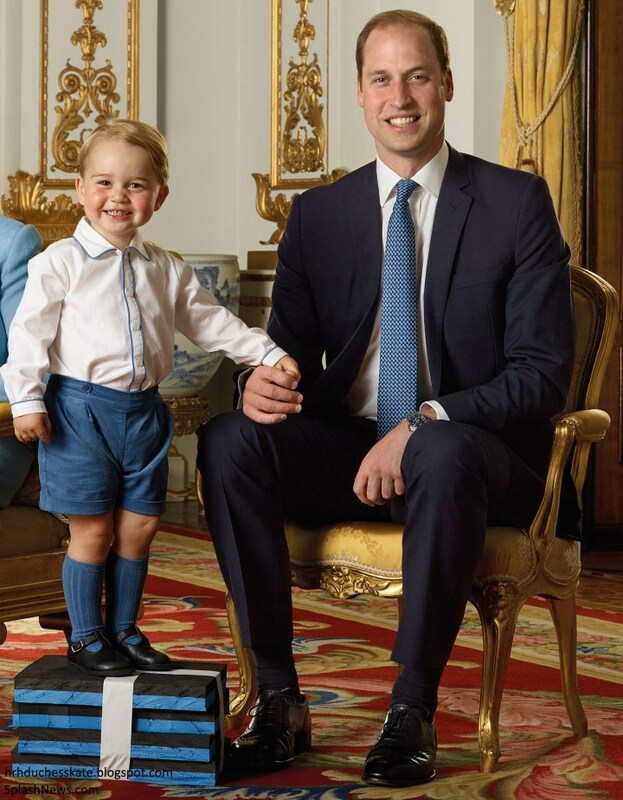 Prince George is such a fearless little guy...imagine he has not even turned 2 yrs old and is standing on 4 blocks of foam for a photo shoot. No big deal. What a delightful surprise. Awwwwwwww! Prince George is adorable and such a smile! He and his daddy literally light up the room together! A most excellent generations of royalty photo! This photo brought such a smile. Love seeing a pic of a happy family in harmony. Prince George looks so proud of himself. So cute! William looks so proud as a father; such a genuine smile. Charles looks delighted, and the Queen at ease. I agree with it all. So perfect! The best part has to be George holding a steady grip on Williams thumb!! Happy 90th Birthday to Her Majesty! Such a amazing milestone! The picture is absolutely wonderful and one I'm sure we'll see for years to come. I love what the photographer had to say about the family interaction and Prince George's energy. He is absolutely adorable with his rosy cheeks and cheeky little smile. Such a handsome little guy! I hope HM has a wonderful day on Thursday and enjoys her family dinner celebration. She is beloved by so many and I hope she feels celebrated on her special day. She is not Queen of the Netherlands. George looks absolutely excstatic to be atop the stack of foam bricks! I think he thought it was great fun! 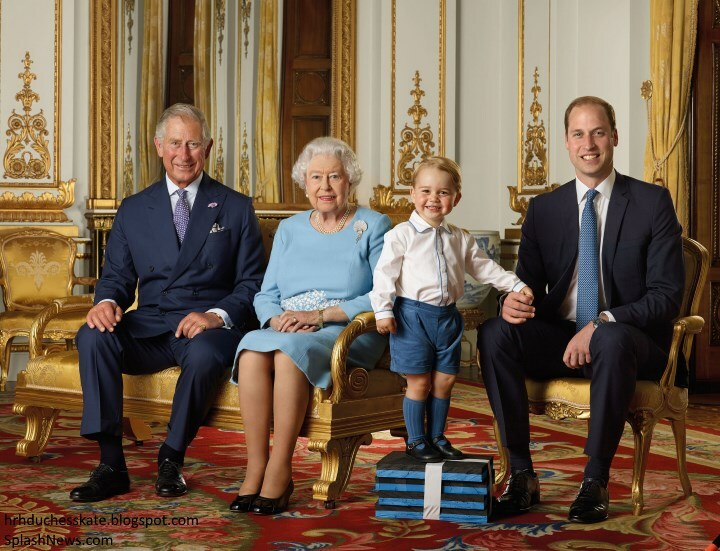 It is a wonderful picture and I think the adults smiles are just a little more special because George is there! I, too, would like to extend my heartfelt birthday greetings to HM! Long live the Queen! George might just be the cutest little boy I've ever seen. What a smile! Really, I'm positively gushing. The rest of the picture isn't bad, either. LOL. I'm going to Buckingham Palace this August to see the exhibit of the Queen's dresses. Maybe I can buy a set of these stamps. George looks irresistibly cute. Full of vim and vigor. Theresa enjoy that tour. How fun. You must share, okay? Photos, tidbits. Theresa - I am so very jealous!! I hope that you have a wonderful time in London. Wow! The commemorative stamp set is gob-smackingly gush worthy. Also, the photos of the King and Queen with the Duke and Duchess prove how much the setting is also part of whether or not a dress works on the person wearing it. In this shot the Tory Burch is perfection. In others it might seem less. I almost want to see Wills in a caftan. Almost. For him it would be too much like playing dress up. even the Queen's rose, I believe. Wonderful picture of the four of them. What a cutie George is. Congrats Rebecca on the new royal baby. Exciting news! Congrats to the happy Swedish couple. That shine in the eye announcing your firstborn. . .there is simply nothing like it. The girl/boy pattern for the Swedish royal family has been thrown out the window with this new little prince :) but all three little princes will be playmates which is nice. The information about the rose and the English garden is strangely interesting. Beaeutiful and delightful picture. In an interview with William (Sky News) we get to see a little of KP? It seems that behind the door of the room in which the interview is done there is a toy basket?? And the room is quite sparingly decorated (of what is visible) telling me it is not that easy to fill up KP and Anmer Hall and Kate and William have not gone over the top with spending money on decorating. What do you think? I think it is a log basket. There is an open fire in the room, but it doesn't look like a room the family live in anyway. Soo cute. Standing there its quite difficult for me to place which side of the family he looks like. Charlotte I'd love to hear your thoughts on the very candid interview William did with the BBC recently! I think it was very interest to see recent criticism addressed - very unexpected and perhaps a sign it's a cause of concern within the family. It was also very insightful to hear Prince William will probably be leaving the EAAA next spring when his contract ends. Initially, it was thought he would stay there for several years. With HM turning 90, perhaps it feels like a good time for a transition into royal life to begin whilst balancing family life and ensuring George and Charlotte have as normal an upbringing as possible. I'll cover the topic in our next post (possibly later today if new photos are released :)). Thanks for the comments Charlotte. So happy to know that William will not be renewing his contract. No more divided loyalties for him hopefully. When William left Anglesey, I think the family thought that he would have to step into the royal duty role because Phillip was poorly at that time. However Phillip seemed to take some rejuvenation pill :) and has recovered marvellously. I think the gap year was in case William had to step in and seeing that did not happen, I have always felt the turning point would come after the Queen turned ninety. There have been subtle indications of this, with more statesman like duties and the refurbishment of Diana's old apartment into meeting rooms. Its all a slow process of preparing. I am not so sure it is all a matter of concern that the problem was addressed, but rather to stem the constant referral to it especially at this time when all the focus should be on the Queens celebrations. I thought both Nicholas Witchell and William were good in his interview. I thought it was a fantastic interview, both interviews he did were terrific. This is a very thoughtful man who knows what he's doing. I just wish some of his critics would give him a little credit for being intelligent and for knowing what his duty is. He's quite right - there are a lot of royal family out doing duties at the moment, his day will come and he will be "the first with his hand up" ready to take it on. Good for him. I was a little curious as to when William thinks he will "grow into his duty". I am four years older than William and feel like I am quite an adult with very important professional responsibilities while managing a family, marriage, health and have been for a while now. Does he think one day magically he will find that he has grown into it? Does he think that the rest of us don't have a duty in a similar sense? How does he envision the rest of us living - quite strange that. It is also curious to me that William thinks of himself as young. 34 is not young - you have been out of graduate school for close to a decade at that point. As for his answer on juggling family, EAAA and royal duties, I thought it was interesting that he listed them in that order and then Nicholas Witchell reversed them as royal role, EAAA, family. A bit of Freud kicking in for both of them there. It was also interesting that he thinks that he needs to prioritize family and that means spending a lot of time with his family, and doing the EAAA job and royal work when he can. That is what the answer basically was. This was obviously a MAJOR MAJOR damage control move by Jason and I am glad he came out and acknowledged the criticism. That sad, I find him to be living in a bubble, and found it unimpressive that is basically doing what he wants because other people in the royal family are working much harder than him. The interview did nothing for me - I still think he is horribly misguided but at least he, KP, Clarence House and BP are listening. And that is a positive thing overall. I couldn't disagree more on that interview but I will wait for Charlotte's post on that. Let's celebrate this lovely photo up there. I thought the questions were vague and generalized, kind of like those silly football interviews with coaches on the field at halftime when everyone is headed into the locker room. I think William answered them as best as anyone could. You know the interviewer's mentioning critiques of Kate had to be hard for him. He didn't answer it either as I recall. Didn't feel like there was anything he had to defend her, knowing she is a diligent person. to heart." Good on him. he will do as she says when she says. We really cannot compare our lives to theirs. It is a different world. Lecia, there's no retirement from the (ultimate) job William will take on. I'm not sure it's a realistic comparison to talk about where the average person is at 30-something vs. William's situation. I think we also need to avoid pulling a phrase or even one word out of an entire interview and dissecting it outside of context. An adorable and landmark photograph for the stamps. I can't wait to see the 'rumored' photograph of the Queen with George and Charlotte!!! And, the information regarding the new Queen of Bhutan rose is great insight into how far ahead planning for the royal tours does start! To have roses ready to be sent to the Queen of Bhutan is not an overnight decision for sure. Love the four generations! George is so cute and I can't wait to see the more recent photos. I am thrilled that Will and Kate have an engagement so close to the end of the tour. I honestly didn't expect to see them for quite awhile. I can't wait to see what Michelle wears! The gifts exchanged during the Bhutan visit are wonderful. I really like Kate's necklace and the meaning behind the symbol is really thoughtful and seems to match well with what people who have met Kate have to say about her. The rose is beautiful and a great way to have a long term symbol of the queen. So glad that this information was released to the public. It's a fascinating insight to what all goes into a royal visit to a country and the diplomacy that comes with it. To have a rose named after you - how lovely! Such a thoughful gift. I'd rather have the necklace, but then- I'm not a Queen. Q and K in Buthan started a rose gaeden last year. So it is very appropriate. Again, yours is "The Bentley of Blogs" Charlotte. Truly the gold standard of Journalism. Seeing the new stamps made my day. Lovely!! What a beautiful picture indeed! I hope the other other two sets of pics are more casual perhaps the great grankids on "Gan Gan's" lap or next to her. FYI, the gift that the Queen of Bhutan gave to the duchess, the beautiful necklace is designed by a Bhutanese jewelry designer named Sonam Rabgye. Check out her website. she included photos where it appears William was wiping a tear or two from his eyes as he and Kate walked away from the bench at the Taj Mahal. Yeah... that was sweat :P It was around 41-44 celsius when they were there. In the DM pictures it looks like he's wiping tears but from another angle you can clearly see it's his forehead. If you look closely you can see waterdrpoplwts from the fountain in front of the picture - the same droplets which seemed ro create white cirlces on C's legs in another pic. Highly doubt he wept! Rebecca 18:31: And reporting on it was simply bad taste. But then I don't know why I would expect any different. Quite appalling actually. Absolutely no tears from William, and how silly to even suggest it. His interview with Sky News was very insightful. He is a most intelligent, thoughtful man, who has the full support and love of his grandmother and father. I was just relaying what Martha Cliff was purporting. Although the William's finger is on his tear duct portion of the eye. Either viewpoint, sweat or tear, is clearly open for speculative debate at this point and each opinion has a 50/50 chance of being the correct one. "William wept" sells more papers than "William sweat." Why does anyone continue to read, let alone believe what that rag and its writers put out. Comic relief, maybe. She wasn't saying he was picking his nose, just perhaps had a tear. Why the tizzies? Are we doing a birthday card for the Queen? Well - William ends his contract with the air ambulance Spring 2017, George begins at London pre-prep school September 2017. So baby number 3 by spring 2017, they have a long summer at Anmer hall and decamp to London to take on more in the way of royal duties September 2017 - shall we see!!!! I agree, except for the baby. In the Queen's whole family, two children is the tradition. Kate has probably suffered enough, and will be as ready in 2917 as William to combine royal and family duties, with a little school boy and a toddler at home. I thought Kate said as much when she commented that George is so lucky to have a little sister. This is a lovely photo and so historic, it's really remarkable, future generations will look at this and see a young "King William" or young "King George" - if things go as planned! Having such a long, direct line of succession in one photo is rare. It's why I never understood why people got their knickers in a twist over Kate's position on the balcony for Trooping last summer! The historic shot was William, holding George, next to Charles and the Queen. The most significant past photos of the Queen are the ones with her father, and even grandfather. Few wonder now where Queen Elizabeth (Bowes-Lyon) is or where Queen Mary is. The fascinating thing is to look at the current monarch with the previous monarchs. Just as few people are asking "Where's Prince Philip?" with these. Future generations will say, "There's King William with his late father and grandmother, when George, Prince of Wales, was only 2!" and beyond that "There's King George when he was young with his late father King William, and his grandfather. And see that woman with them, that was Queen Elizabeth II, the longest reigning monarch in British history!" What a lovely photograph, and what a fun look into the "behind the scenes" setting for the postage stamp portraits. Thank you Charlotte. Such a lovely picture! Do you know for how long the stamps will be available? I will be in London in June and would prefer to buy them there instead of ordering them online. George has mastered his first duty at age 2, posing for photos with a big smile. That is actually a HUGE smile. Add his round cheeks, he looks like a happy little version of Winston Churchill. 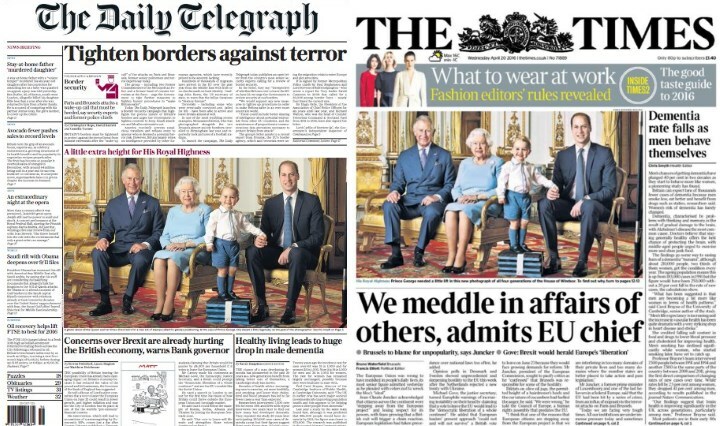 He had even exceeded that duplicate image of M.Middleton. In light of the gift of 75 rose bushes and the rose named for the King and Queen of Bhutan, that flamboyant Tori Burch gown finally makes some sense. It is covered with flowers! And it looks much better in the royal setting than at the hotel. I still think it is overly busy in pattern, but I am beginning to see Kate's logic in selecting it. The Queen's necklace gift to Kate is lovely, and so personal. I think it is quite touching, and I hope Kate wears it often. I know that there are indications that a branch of the Celts lived in the Chinese desert. But I don't know whether the plaids in the Bhutanese fabrics and the knot design in the necklace are ancient, or whether they have been borrowed in more or less modern times, in one direction or the other. Does anyone have some insight into the history of such patterns in Bhutan? 04:31- Interesting thought about the Celts and Bhutanese design. seems to always have a logical and often sort of lyrical inspiration. Anonymous 21 April 2016 at 13:44, I appreciate your perspective. I think Charlotte resembles Kate's father ?